I must admit I went into this novel with very high expectations based on the reviews on Goodreads. Unfortunately, myself and the novel did not end up forming a solid friendship. I am a HUGE fan of the science-fiction genre, and I always get really excited when YA/NA authors decide to write a novel in this genre. But having read some pretty epic sci-fi recently, These Broken Stars, just didn’t work. Essentially, this is a pretty good book about the love between two people … but sci-fi is a genre that promises adventure and epic technology, things that this book is lacking in. A spaceship that crashes just doesn’t do it for me, and it’s this lack of adventure in the overall novel that really put a wedge between myself and the book. There was a lack of spark, especially when it was more about the romance aspects of the two characters rather than the overarching story. 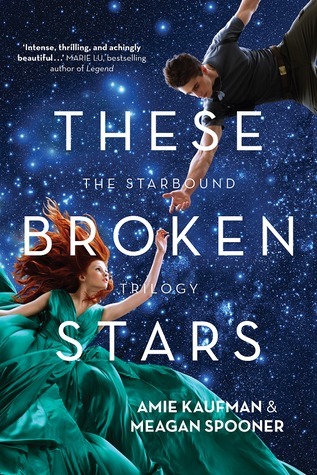 These Broken Stars begins fruitfully, we are introduced to Tarver Merendson and Lilac LaRoux, the two main characters of the book, on board a large spaceship bound for … oh I can’t even remember anymore. There’s a little bit of flirting, and a lot bit of ‘oh woe, I’m the daughter of a powerful man so I can’t be seen with any guy’ throughout the first few chapters. I kept waiting in anticipation for the fun to happen and it was sad to say I enjoyed the interrogation bits between Tarver and some officer after each chapter more that I actually enjoyed the chapters. Lilac’s chapters really annoyed me for some reason, and I just couldn’t see her being both so preppy and an ace mechanic when the time came. She did grow on me though, but only slightly. Tarver’s chapters were much more enjoyable and I could understand his struggles with Lilac after they crashed on that planet. During the first few days of their crash, I grew increasingly more annoyed at Lilac and her ‘my father will rescue us’ mentality, almost wanting to punch her at one point. She refused to listen to Tarver or accept his help – help from someone who has field experience, mind you – because she’s Lilac LaRoux. Screw survival, she was more worried about how it’d look to her father. I’m sorry but I would put life/survival ahead of reputation, just sayin’. The rest of the book moved along slowly and so did the relationship, which I was thankful for. Lilac managed to become less annoying, especially when Tarver was injured. Unfortunately, I just didn’t feel like their relationship had all that much chemistry at all, which was sad because there was so much potential there. But moving on to the actual plot, which was rather slow and unadventurous to be quite honest, I found the voices/spirits/other beings that aided Tarver and Lilac on their journey towards that station made little sense. I know why they did it, but they seemed inconsistent in their mission. When Lilac died, I found it odd that they didn’t warn her about it, but rather expended their energy in bringing a version of her back to life. And while that death was quite unexpected, but I was willing to accept it and move on. What I’m annoyed about is the fact that she’s brought back to life but doesn’t disappear again. I think the story would have been much stronger if the authors had been brave enough to kill off one of their characters. I would have liked to be given a more thorough background into LaRoux Industries and why Lilac’s dad is such a feared person. I suppose it would be slowly revealed to us in the next book, but this lack of understanding as to why Lilac and the rest of the planet is basically sitting in the palm of his hands was a major reason that deterred me from connecting with this novel. I mean, it’s not badly written, but I just had higher expectations for a more genre-orientated novel and less focused on romance. Plenty of readers have loved this book, but it just wasn’t right for me. Thank you to Allen & Unwin Australia for providing me with a copy in exchange for an honest review.